Papa Murphys menu is actually quite impressive. They provide a good selection of crowd-pleasing pizzas, along with some specialty pizzas and "lite" options. Papa Murphys also offers a good selection of yummy salads, calzones, dessert pizzas, lasagnas and bread sticks. A full-meal deal! What are we waiting for? Does This Take And Bake Pizza Selection Stack Up? 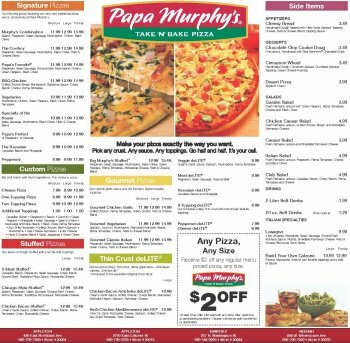 Take a look at the selections below to see the pizzas offered on Papa Murphy's menu. Papa's Cheese Pizza - lots o' cheese! Pepperoni Pizza - lots o' pepperoni! Hawaiian Pizza - Canadian bacon & pineapple. Murphy's Combination Pizza - Salami, pepperoni, Italian sausage, mushrooms, onions and black olives. Specialty of the House Pizza - Italian sausage, mushrooms, olives, herb and cheese blend. Papa's All Meat Pizza - you guessed it, all meat, including Canadian bacon, sausage, pepperoni, salami and beef. Cowboy Pizza - pepperoni, sausage, mushrooms, black olives, herb & cheese blend. Papa's Favorite® Pizza - pepperoni, Italian sausage, ground beef, mushrooms, onions, green peppers and black olives. Gourmet Chicken Garlic Pizza - Grilled chicken, Roma tomatoes, green onions and herb & cheese blend. Gourmet Vegetarian Pizza - Fresh spinach, zucchini, mushrooms, artichoke hearts, Roma tomatoes, and onion mix. Gourmet Italian Pizza - Premium pepperoni, Italian sausage, mushrooms, Roma tomatoes, and green onions. Papa Murphys menu does offer something that we haven't yet seen at the big delivery chains...a group of pizzas considered to be a lighter option. Called the deLITE® Pizza, these pizzas come with an thin, crispy crust. According to PM, they have 1/2 the carbs and 1/2 the calories of the same pizza on their original crust. A great option is you're watching the waistline. Select the vegetarian option and you're really being good. Cheese deLITE® - herb tomato sauce and three cheeses. Pepperoni deLITE® - same as above but with pepperoni too. *Meat deLITE® - three meats - pepperoni, Italian sausage, beef, and herb tomato sauce and three cheeses. Veggie deLITE® - spinach, mushrooms, and Roma tomatoes, three cheeses, and creamy garlic sauce. Hawaiian deLITE® - Canadian bacon, pineapple, herb tomato sauce and three cheeses. In case one layer of dough and cheese isn't enough for you, there's the stuffed pizza option. Apparently the family size stuffed pizza weighs about 5 pounds! Chicago-Style Stuffed Pizza™ - salami and pepperoni, Italian sausage, beef, and onion mix. Garnished with Roma tomatoes and green onions. Besides the thin deLITE crust, there doesn't appear to be a lot of crust options on Papa Murphys menu besides their original and stuffed. Their original crust is a happy medium between thin and thick, so it is a crowd-pleaser. Papa Murphy's hadn't yet jumped on the online ordering bandwagon, but they are working on it.